consider when selecting an appropriate diet for your cat. Cats are obligate carnivores, which means that they rely on nutrients found only in animal products. 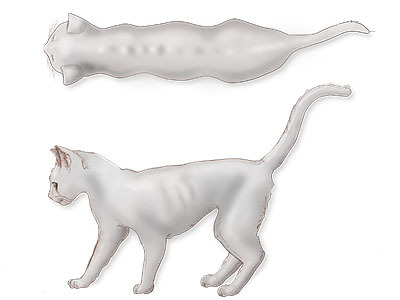 Cats evolved as hunters that consume prey that contains high amounts of protein, moderate amounts of fat, and a minimal amount of carbohydrates, and their diet still requires these general proportions today. Cats also require more than a dozen other nutrients, including vitamins, minerals, fatty acids, and amino acids. Although your cat needs certain amounts of each specific nutrient to be healthy, more is not always better. This is particularly true of vitamins and minerals, so the use of supplements is usually not necessary if you are feeding a balanced and complete diet. Supplements can be harmful to your cat, and they should never be given without a veterinarian’s approval. Cats should have access to clean, fresh water at all times. Commercial cat foods are formulated as dry, semimoist, and canned. These products differ in water content, protein level, caloric density, palatability, and digestibility. The pieces of dry food are often then coated with flavor enhancers, such as animal fat, to make the food more appetizing. Dry cat food is relatively inexpensive, and since it does not dry out, it offers owners the convenience of “free choice” feeding. However, dry food may be less palatable to a cat than moist or semi-moist food, and depending on the types and quality of the ingredients, may also be less digestible. If you do use dry food, it is important to store unused portions in a cool, dry location, and not to use the food after its expiration date. Owners often buy large amounts of dry food that can sometimes be stored for months, so checking the expiration date before feeding it to your cat is very important. Storing food for a long period of time decreases the activity and potency of many vitamins and increases the likelihood that fats will become rancid. It’s a good idea to store dry cat food in an airtight container to help prevent nutrient deterioration and maintain flavor. Meat and meat byproducts are the primary ingredients of semi-moist food, which contains approximately 35 percent moisture. Other materials, including soybean meal, cereals, grain byproducts, and preservatives are added to make the final product. The cost of semi-moist food is generally mid-range. Semi-moist foods may be more appealing than dry cat food to some cats and can also be fed free choice. After the package is opened, however, the food can dry out, becoming less palatable and/or becoming rancid. Canned cat food has a moisture content of at least 75 percent, making it a good dietary source of water. It is generally the most expensive type of cat food, but is also highly palatable for most cats. Many different varieties are available, which can be helpful if your cat is a finicky eater. Canned food has the longest shelf life when unopened, but any unused portion of opened canned cat food should be refrigerated to maintain quality and prevent spoilage. Gourmet canned cat foods generally feature meats, such as kidney or liver, and whole meat byproducts as primary ingredients. Some brands, however, may be nutritionally incomplete, and it is important to read the nutrition labels carefully on such specialty cat-food items to ensure that they have a nutritional guarantee. Commercially prepared cat foods have been developed to give your cat the correct balance of nutrients and calories. Basic minimum nutritional requirements for cats have been established by the Feline Nutrition Expert (FNE) Subcommittee of the Association of American Feed Control Officials (AAFCO), and manufacturers use these standards in producing cat foods. Reading the nutrition label on food packaging is the best way to compare cat foods. Pet food manufacturers are required to supply certain nutritional information on the package. Labeling regulations are established by the AAFCO and the United States Food and Drug Administration. All pet foods that carry an AAFCO-approved nutritional guarantee, often referred to as the“AAFCO statement,” are considered to be nutritionally complete and balanced. A cat’s nutritional requirements change through different stages of life. These stages include kittenhood, adulthood, pregnancy, and lactation. The nutritional claim on the cat food label should state the stage of a cat’s life cycle for which the food is complete and balanced, and that it meets the requirements of the AAFCO. Some cat foods are formulated for all life stages, which can simplify the selection process for owners with multiple cats of different ages. In choosing a cat food, it is also important to read the ingredients list. As with human foods, the items are listed in order of decreasing proportional weight. Look for foods in which meat, meat byproducts, or seafood are listed among the first few ingredients, as this indicates the food probably contains enough animal-source ingredients to supply essential amino acids and fatty acids. Once you have determined that a food is complete and balanced, choosing between the types of food may be a matter of what your cat prefers. Some cats like canned food, some like dry food, and some like a combination of the two. Choose the ones that work best for your cat. Making your own cat food is a difficult and time-consuming process, as the recipe may not contain the right quantities and proportions of nutrients for your cat. It is generally recommended that cat owners purchase nutritionally balanced commercial foods, unless a veterinarian recommends a home-formulated recipe for medical purposes. In that event, your veterinarian will likely recommend a recipe developed by veterinarians certified in animal nutrition. While giving your cat an occasional treat is not generally harmful, they are usually not a nutritionally complete and balanced source of nutrition and should only be fed occasionally. A good rule of thumb is not to let treats exceed 10 to 15 percent of a cat’s daily caloric intake. In addition, some foods should be avoided completely. Although raw meat is an excellent source of many nutrients, it is not recommended as a food or a treat for cats, because it is a potential vehicle for toxoplasmosis and other infectious diseases. Some cats that have consumed canned fish products meant for humans have developed potentially serious neurological disorders. Milk is not generally recommended as a treat for cats, as many cats are lactose-intolerant and can develop gastrointestinal problems if fed dairy products. Cats can be choosy about where they eat. Keep in mind that heavy-traffic areas, noise, the presence of other animals, dirty food containers, or nearby litter boxes can deter a cat from eating. Try to be sensitive to your cat’s eating behavior, and make necessary adjustments. Maintaining a healthy weight is another important consideration. Cats vary greatly in the amount of food they need to consume to ensure they don’t become over-or underweight. 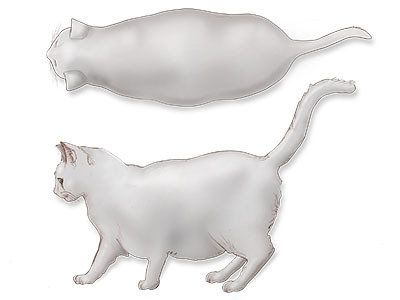 Obesity is the most common nutrition-related problem in cats, and makes cats susceptible to a number of health problems, including arthritis and diabetes. 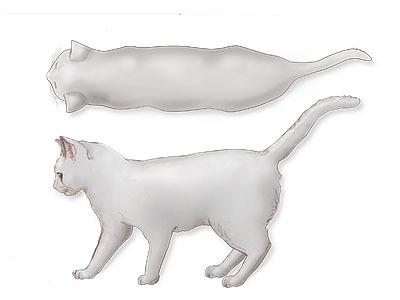 Ask your veterinarian to help you determine the ideal body weight for your cat and follow their suggestions for adjusting your cat’s diet to reach and maintain that weight (Figure 1). Although many cats are content to eat a single food, some cats may develop finicky eating habits and become very selective about what foods they’ll accept. Feeding your cat two or three different cat foods provides flavor variety, and may prevent your cat from developing an exclusive preference for a single food. A cat that refuses to eat can develop serious medical problems. This is true for sick cats that lack an appetite, for cats on a diet, and for the finicky cat that refuses to eat. A veterinarian should examine any cat that refuses to eat and is losing weight. BCS is a 5 or 9-point scale used to subjectively characterize body weight and muscle mass. Below are examples of BCS using a 9-point scale, with 5 being ideal. BCS 1: Ribs visible, no palpable fat, severe abdominal tuck, spine and pelvis bones palpable. BCS 5: Well proportioned, waist behind ribs, ribs palpable (slight fat covering), abdominal fat pad minimal. BCS 9: Ribs not palpable (heavy fat cover), heavy fat deposits (lower back, face, limbs), no waist, large abdominal fat pad.